RENTON, WA. 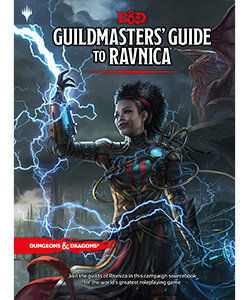 – July 23, 2018: Wizards of the Coast is psyched to announce the first collaboration on a major product between Dungeons & Dragons and Magic: The Gathering with Guildmasters’ Guide to Ravnica releasing everywhere on November 20. The book will contain everything fans need to play D&D in the world-spanning city of Ravnica, the fan-favorite Magic setting populated by ten rival guilds, each with its own ethos and agenda. Wizards is also announcing D&D fans can now return to a magic-heavy noir setting with Wayfinder’s Guide to Eberron, a new document written by Keith Baker available online now. The exploration of these settings is a testament to how fan excitement can shape where D&D travels to next.